Okay, nonsense aside, the new condition Manfrotto Universal Clamp is on sale for $10 with free shipping at Adorama and by Amazon itself (Prime only). This has a 1/4 thread which saves the day. The new condition Manfrotto Compact Monopod Red is currently on sale for the very specific price of $22.39 by Amazon itself with up to five per customer. The shipping estimate though is “within 1 to 2 months”. The price at B&H Photo is $24.88 but shipping is free only with orders of $49+, so either two of these, or append it to another order. Clearance time! All you pay is $4 with free shipping (no minimum-amount purchase required for free shipping) and for that, Adorama will send you the new condition Manfrotto Replacement 1/4″ Screw/Turnbuckle for 200PL-14. It is not a pacifier! It’s monopod time now! For a limited time, Adorama is offering the new condition Manfrotto XPRO Land Aluminum Monopod (5 Sections, 55″ Max Height) for $40 with free shipping and handling. No coupon, no rebate, just add to cart and proceed to checkout while this promotion is running. For more Adorama action, check our earlier round-up of their latest open-box, refurbished and other offerings. As of 3/8/18 recheck, this sale ended… Adorama is offering the new condition Manfrotto Amica 20 Shoulder Bag for $10 with free shipping for a limited time. It averages 4.8 out of 5 based on 9 customer reviews. You can buy as many as you like. It’s not the power of love. It’s the power of Costco! The new condition Manfrotto Windsor Explorer Camera Backpack is on sale for $50 with free shipping for Costco members. But if you are not a Costco member, you can buy it too! You just have to pay a 5% non-member surcharge, making it $52.50 instead of $50. Adorama is offering the new condition Manfrotto XPRO Land Aluminum Monopod for $50 with free shipping and handling for a limited time. Speaking of Adorama offers, they are also offering the new condition Bushnell 16x50mm PowerView Weather Resistant Porro Prism Binocular for $30 with free shipping. No coupons, no rebates, just add to cart and proceed to checkout. Speaking of Manfrotto, continuing at Adorama is the Manfrotto NX Shoulder Bag + Manfrotto PIXI Aluminum Mini Tripod for $20 with free shipping. Doorbuster time at Adorama! 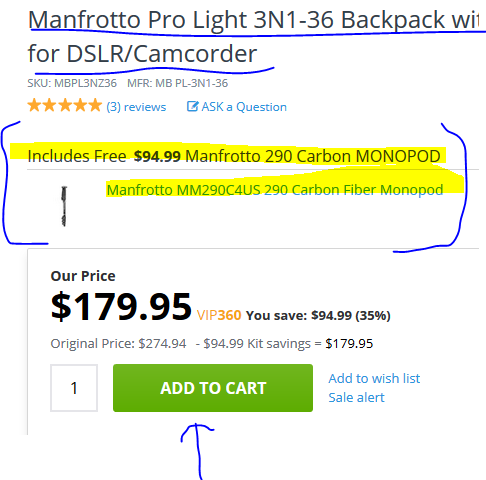 They are offering two Manfrotto items for $20 with free shipping. No coupon, no rebate, no minimum purchase required. It is the Manfrotto NX Shoulder Bag + Manfrotto PIXI Aluminum Mini Tripod. This is a pretty good deal since each one often goes for that price on its own. For more action, check the Adorama Cyber Monday II sale. + the freebie is determined by which product you buy as seen on the promotional page. You don’t have a choice from the freebies. You don’t have to do anything to get the freebie (other than buy the qualifying product). No coupon, no rebate, no shopping cart gymnastics. Eligible items mention this promotion on their product page. For example, here’s the product page for the Manfrotto Pro Light 3N1-36 Backpack with 3-Way Wear. You see the offer mentioned (screenshot below). Just add the bag to the shopping cart and the free item will be included automatically while this promotion is running. If you don’t see it, it means the promotion expired or there’s something wrong. The clock is ticking! I can’t post them all! But I’ll post as many as I can 🙂 Thankfully this offer runs until 11/30/17, so you have plenty of time to ponder. It is at B&H Photo with free expedited shipping, the new condition Manfrotto 190Go! Aluminum Tripod Kit with Ball Head for $160! No coupons, no rebates, just add to cart and proceed. A tradition unlike any other. No, not the Masters on CBS, but the return of the holiday shopping season sale of the Manfrotto MTPIXI-B PIXI Mini Tripod 🙂 It is currently in synchronized price swimming for $17.61 with free shipping for all at Adorama and B&H Photo. The usual free shipping terms apply at Amazon by Amazon itself (Prime or $25+ order). The new condition Manfrotto MVH502AH Fluid Video Head with MT055XPRO3 Aluminum 3-Section Tripod is a Black Friday sale at Adorama going for $250 with free shipping and handling! No coupon, no rebate, it’s an old fashioned sale! We just had a burst of seven Olympus posts covering the refill of the Outlet store. So time for something else. Something gift-y! If you are not afraid of mail-in rebates, Adorama is offering the new condition Manfrotto BeFree Live Video Kit with Tripod and Fluid Head (includes Case) for $129~ after a $60 mail-in rebate (MIR). PS: the sale of the Lowepro Adventura 140 Camera Shoulder bag ended at Adorama, but it continues for $10 at Amazon by Amazon itself for Prime members only, so free 2-day shipping. Nitro is not just the trending cold brew coffee at Starbucks. It’s also trending at Manfrotto, their new line-up of Manfrotto Nitrotech tripod-alia is now available for pre-ordering at Adorama. The N12 head goes for $600, while the three tripod bundles range from $1100 to $1480. These are not the only new arrivals at Adorama, they also have new lightning products from Flashpoint, Glow and 3Pod. The 3Pod ball heads range from $20 to $50, the Glow reflectors range from $40 to $80, while the Flashpoint Rapid Monolights range from $550 to $800, while the Orlit Roverlights range from $560 to $620. A storm of price-matches! The new condition Manfrotto 5-Section Compact Action Aluminum Tripod in the black color scheme, model MKCOMPACTACN-BK, is on sale and price-matched to the very specific price of $58.88 with free shipping at Amazon by Amazon itself (limit 5) and Adorama and B&H Photo. … but if you are comfortable with used, you can get it in “Used – Very Good” condition (cosmetic imperfections; repackaged) for the very specific price of $14.28 by Amazon Warehouse Deals itself. Free 2-day shipping for Prime members or with a $25+ order for non-members. … then to Amazon Warehouse Deals we go where you can get it in “Used – Good condition” (cosmetic imperfections; damaged original packaging) for the very specific price of $99.64 with free shipping, sold by Amazon Warehouse Deals itself. … but reality is this bundle, the Canon EF 24-70mm f/2.8L II lens is bundled with the Manfrotto MT055XPRO3 Aluminum 3 Section Tripod with Horizontal Column, together going for $1749 with free shipping at Adorama. This is the same price of the lens on its own, so you are essentially getting the tripod for free. Speaking of Adorama, they have a 2-day Flashpoint Studio and Lightning Sale with around 50 items participating in the sale. This started yesterday but was lost in the home page with the Prime Day avalanche. The new condition Canon EF 24-70mm f/2.8L II USM Lens goes for $1699 at authorized Canon USA dealers, and you have the option to get a free 13-month Accidental Damage protection by registering your product within 30 days of purchase. However, at the moment, Adorama is bundling this lens with a FREE tripod. And it’s not a toy tripod! It is the Manfrotto MT055XPRO3 Aluminum 3 Section Tripod with Horizontal Column (19.84lbs Load Capacity, 66.93″ Maximum Height). The tripod is included in the product bundle above, you see it mentioned over there while this promotion is running. On the other hand, if you have enough tripods to re-enact the Planet of the Tripods movie, and if you prefer general purpose accessories, Adorama has an accessory bundle offer with these freebies: 82mm lens filters kit, lens shade, cleaning kit, Corel software bundle (five software titles), and other assorted lens-accessories. But if you instead want to optimize for a lower price, and you don’t need any extra accessories, and you are comfortable with imported grey-market lenses that come with a 1-year seller warranty instead of a 1-year Canon USA warranty, you can get this lens in new condition but imported grey-market for the very specific price of $1591 with free shipping by 6ave on eBay (99.1%, New Jersey). Limit five per customer. Over 200 units got sold so far from this listing. Bag The Bags round-up: Manfrotto Essential DSLR Camera Backpack for $40 and MORE! The new condition Manfrotto Essential DSLR Camera Backpack is on sale for $40 at B&H Photo as one of their Featured Sales. Free expedited shipping IF your order total is $49+, otherwise shipping is additional. While we are at B&H Photo, the Sunpak DF3000C Digital Flash for Nikon Cameras is on sale for $24.75 plus shipping. But you get free shipping if your order total is $49+. More in-stock action at Adorama, the Manfrotto Nitrotech N8 Video Head system now have three different options in-stock and shipping at Adorama. The Nitrotech N8 Video Head on its own goes for $500, while the bundle with the 546B Pro Tripod with Mid-Level Spreader goes for $950, and the bundle with the 535 Carbon Fiber Tripod goes for $1180. On the other hand, if you prefer a Manfrotto appetizer, the MTPIXI-B PIXI Mini Tripod continues for $18~ (limit 10). It’s “Pixi” time again, the black color scheme of the new condition Manfrotto MTPIXI-B PIXI Mini Tripod is on sale for $18~ at Amazon by Amazon itself and at B&H Photo. Neither offers unconditional free shipping. At Amazon, you either have to be a Prime member, or place a $35+ order. At B&H, you have to place a $49+ order.